My husband is the king of spontaneous trips to Grand Haven, Michigan. When we were young and just married, we’d hop into his sweet Mazda RX7 and we’d speed away to catch the sunset over the lake. Then then kids came. And quickly. 3 in 21 months. Yowch. Our spontaneity was reduced to unexpected 3 am feedings and surprise diaper blow-outs. You know what I’m talking about. With kids that young, every trip out of the house takes a good deal of planning. Plus, the cool sports car didn’t have space for 3 car seats, diaper bags, triple stroller, and enough snacks to feed a whole daycare center. Until the past few years. Now we have an eight year old and a couple of six year olds. I mean, I love babies….but kids are way easier for me. Not to mention, they’re a whole lot of fun. 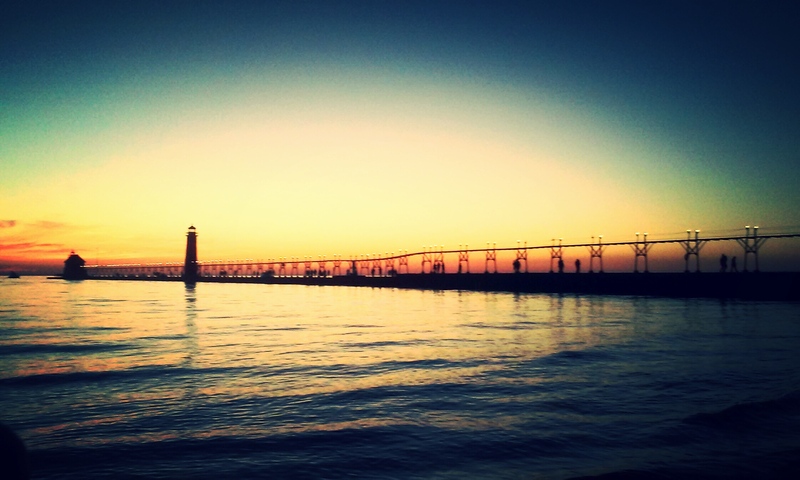 Jeff came home from work on Friday and asked if I’d like to go watch the sunset in Grand Haven. Of course I did! I’m a sunset girl! Plus, winters in Michigan mean long stretches of no sun at all. So, I was all about it. We fed the kids mac & cheese, told them to grab sweatshirts, packed a snack, and headed out the door. We made it just in time to watch the sun touch the ripply water of The Big Lake (what Michiganders call Lake Michigan). The sun took its time and for that I was grateful. As far as I’m concerned, there is nothing quite like a sunset on Lake Michigan (and I’ve seen plenty of sunsets in different hemispheres). Jeff, the kids, and I talked about the colors, how they played on the clouds. They stood at the very edge of the ebbing water, running from it when it rose back onto the shore. 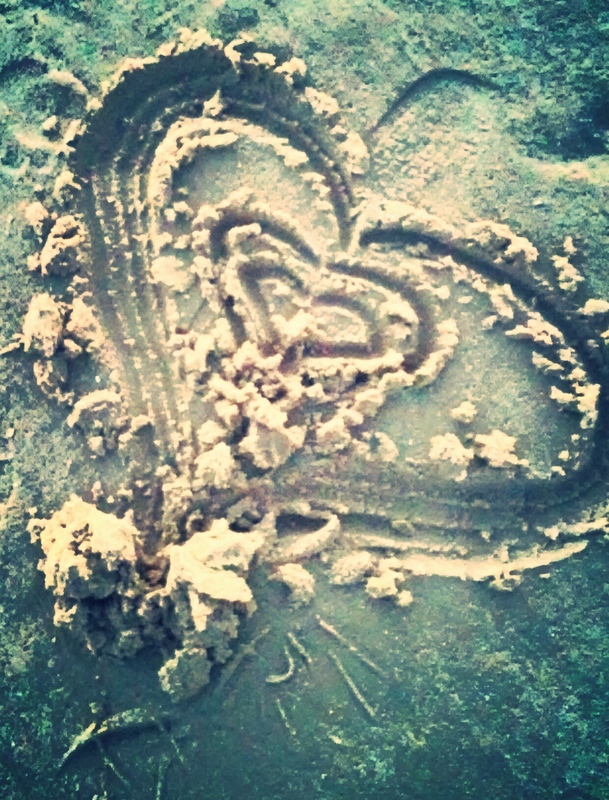 My daughter drew a heart in the sand. 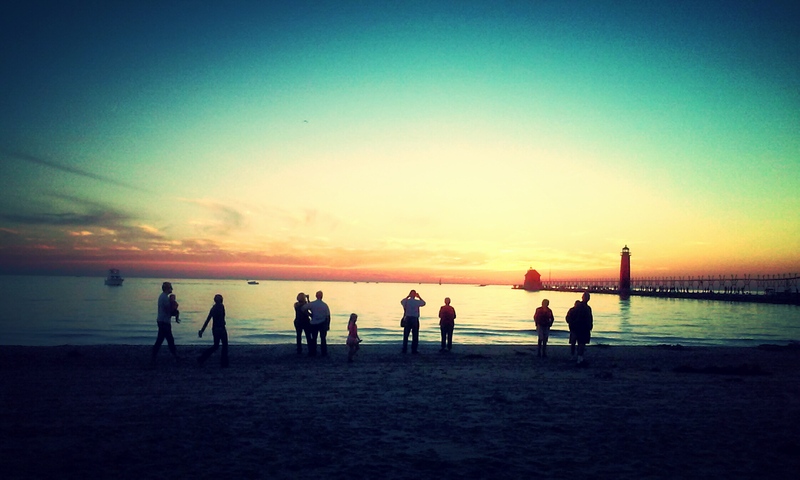 Then I noticed how many people had journeyed to the Lake that evening. Folks walked up and down the pier, others sat on the sand, a couple tossed a football back and forth. You know what most of the people were doing, though? Most of them were watching the sun in its daily grand finale. It was a worthy show, for sure. Here we were, all with different pasts and presents. All who will have various trails of futures. We didn’t know each others names or where we came from. But we did share one thing. The sunset over The Big Lake. No profound thoughts. Nothing poetic to share. Just a shared awe in the beauty of a sunset. A sunset that my kids called “God’s Art for us to see”. ← Authors and Books and Signing! OH MY! Beautiful pics, Susie! When my dad was young, an artist told him that sometimes the sunsets would come up with colors so bright that if he painted them exactly that way, they would be too vivid to believe. I think that’s a good description of the art God creates on the earth… and in our lives. Yes, Raelee. God’s colors are vivid. So beautiful. Thanks for sharing that insight from the artist! Sometimes just sharing a great story is the point. Thank you!